The Trafalgar, Esquesing and Erin Road Company established a toll gate on Trafalgar Road in Oakville near the present site of Inglehart Street. Tolls were collected to pay for the maintenance of the plank road that was to be built from Oakville to Fergus. We decided to return to Sixteen Mile Creek and continue north from Kerosene Castle, hiking on the east side of the creek. We parked on Inglehart street near Trafalgar. It was cloudy and windy with a temperature of only 7 degrees. The Hamilton Radial Electric Railway Company was chartered in 1893. In 1905 it was extended to Oakville and a large steel bridge was constructed across Sixteen Mile Creek. 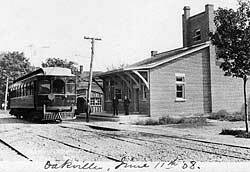 The Oakville station is seen in this archive photo as it appeared in 1908 with one of the electric cars in front. 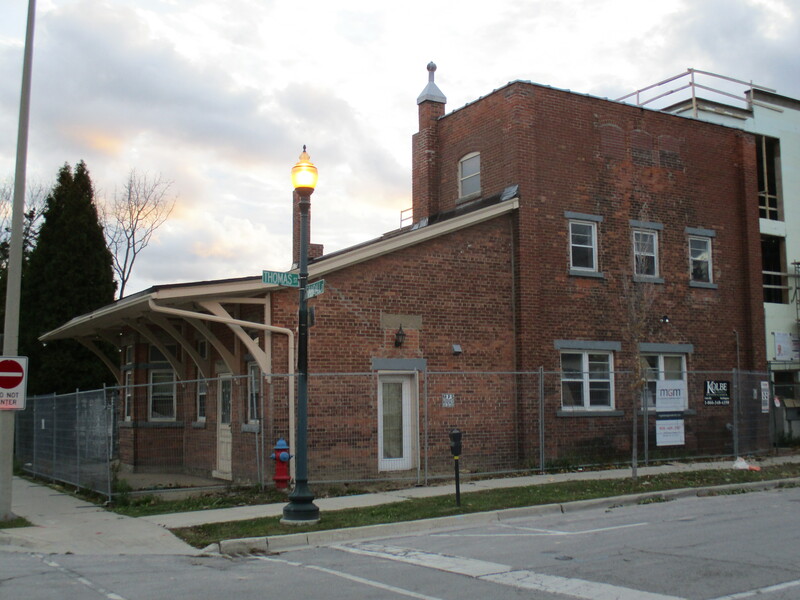 The Oakville station is the only remaining one on the line but the building is abandoned today and has some broken windows on the front. We took a short trip down to the site of the old station before starting our hike. Some windows have been added to the rear portion of the building but otherwise it retains it’s original charm. 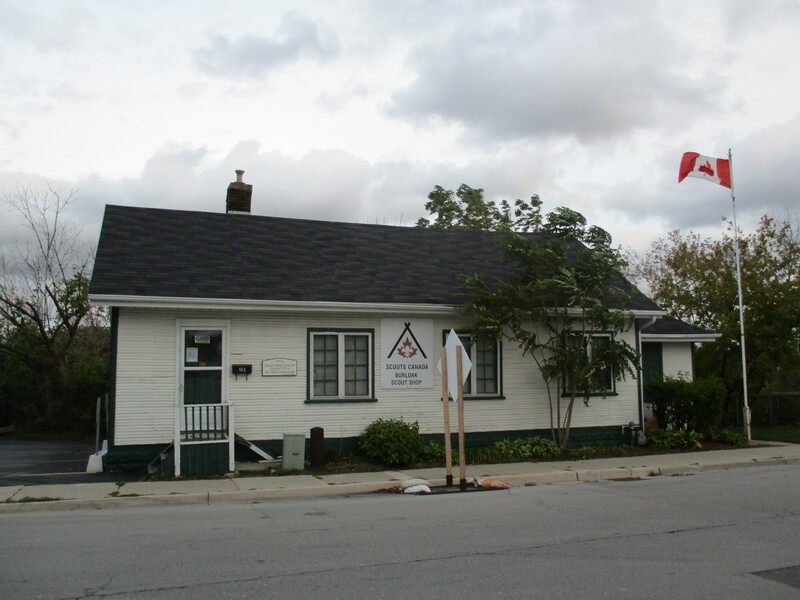 Directly across the street from the train station is the Scout Hut built in 1926. The location is perfect since Scouts were expected to be well trained. John Cross introduced the growing of strawberries to Oakville. He found that the fruit grew wild in the area and was easily cultivated. Soon others were following suit and by the mid 1870’s Oakville was the primary strawberry production area in the Dominion of Canada. The delicate fruit was easily damaged and so to support it’s storage and transportation a local basket industry developed. Cross designed a wood veneer basket that he produced. Soon John A. Chisholm opened his own basket factory and expanded operations in 1874. His son, Charles, invented a machine to slice wood veneer for the baskets. By 1877 there were almost 750,000 fruit baskets being produced each year in Oakville. In 1889 he sold the business which was re-named the Oakville Basket Company three years later. Although it was destroyed by fire twice it was rebuilt each time. It operated until 1984 when it was finally shut down. In it’s later years all the local strawberry fields had been subdivided for housing and so the factory produced Popsicle sticks and tongue depressors. 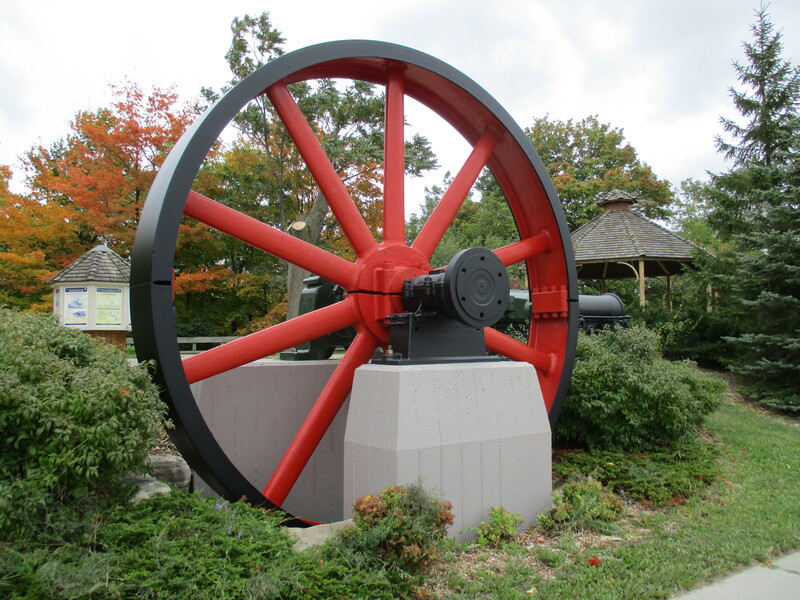 The drive wheel from the steam generator has been preserved and is located in Old Mill Parkette. We descended to the level of the creek soon after we crossed Trafalgar and began to make our way upstream. It was a windy morning and we were watching the wind burst in sudden swirls on the surface of the water. Suddenly we heard a loud crack from directly across the creek and looked in time to see three quarters of a large tree collapse to the right. As it came to rest the remaining section topped in slow motion to the left. In all my time spent hiking in the woods this is the only time I’ve witnessed a tree fall and it most certainly does make a noise. The broken and twisted remains of the tree stump can be seen in the picture below. 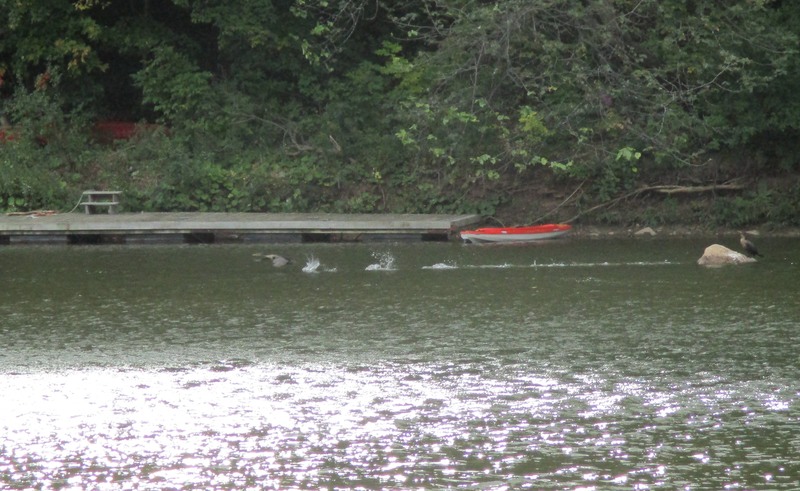 Cormorants were fishing in the Sixteen Mile Creek. The rock on the right in this picture had three of them standing on it at one point. As they flew away they almost skipped across the top of the water like a flat stone. The bird on the wing below slapped the water fast enough that the spray from the previous two impacts hasn’t settled back into the creek yet as it reaches for the next wing flap. 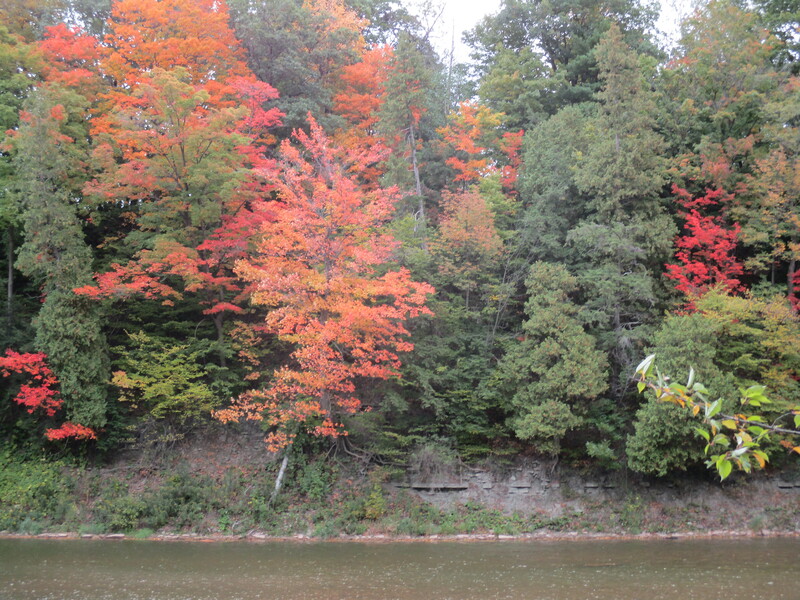 The fall colours are still not at their prime but there are places where the display is beginning. The trigger for change is the shorter hours of daylight which causes in the change to happen at nearly the same time each year, regardless of the temperature. 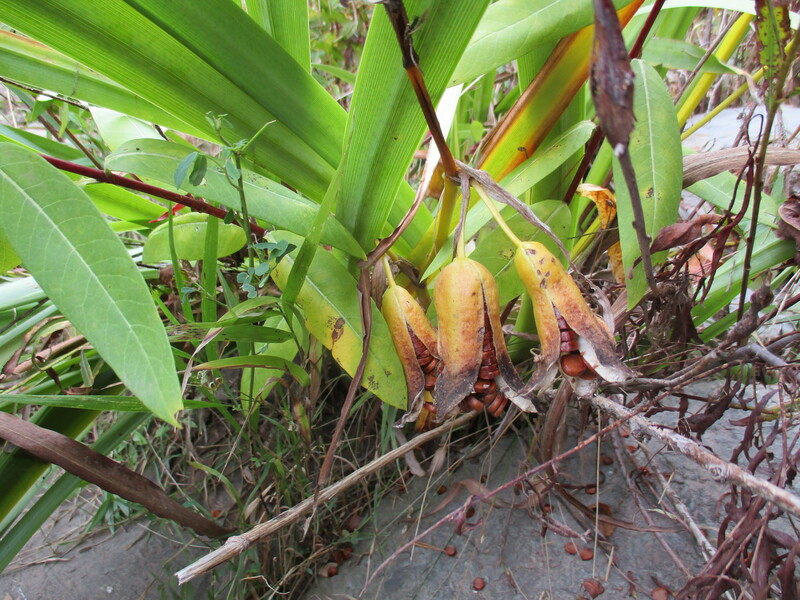 The yellow iris has seed pods that contain rows of brown seeds. These seeds react to the freezing and thawing cycle in the spring to wake them from their dormant state. We made our way along the shale embankment on the east side of the creek. 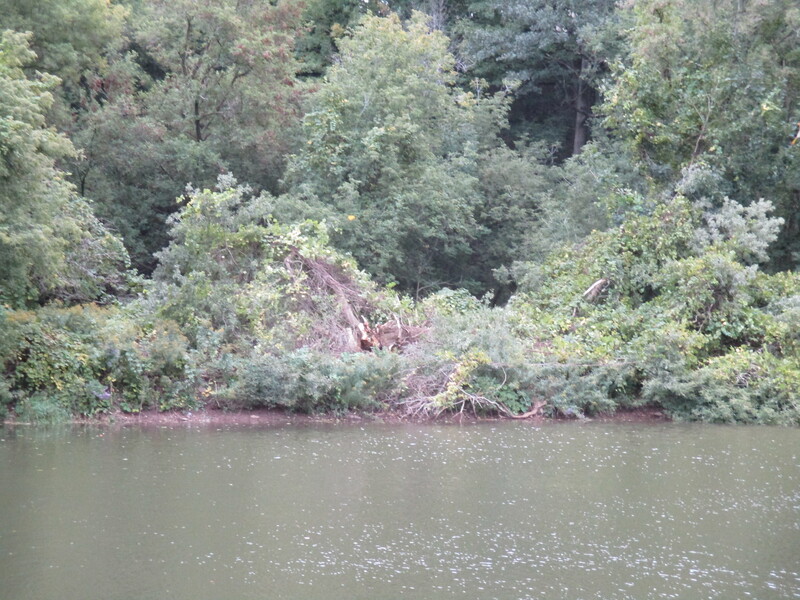 There were many places where we had to go part way up the embankment to get around a fallen tree or a place where there was no footing at the water’s edge. 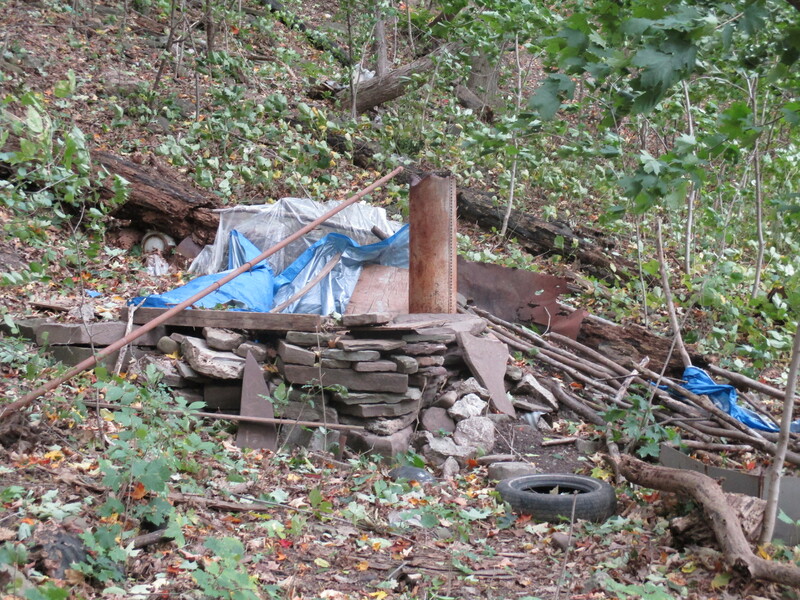 It’s quite common to find the remnants of some person’s temporary shelter in the woods. Seldom do they take the time to build from shale and have a more durable home complete with a fire place. A little past the shale home in the woods we decided to climb the hill where we found the Oakville St. Mary Pioneer Cemetery. This cemetery contains Oakville’s founder William Chisholm and the first mayor George King Chisholm in a separate family plot surrounded by a wrought iron fence. 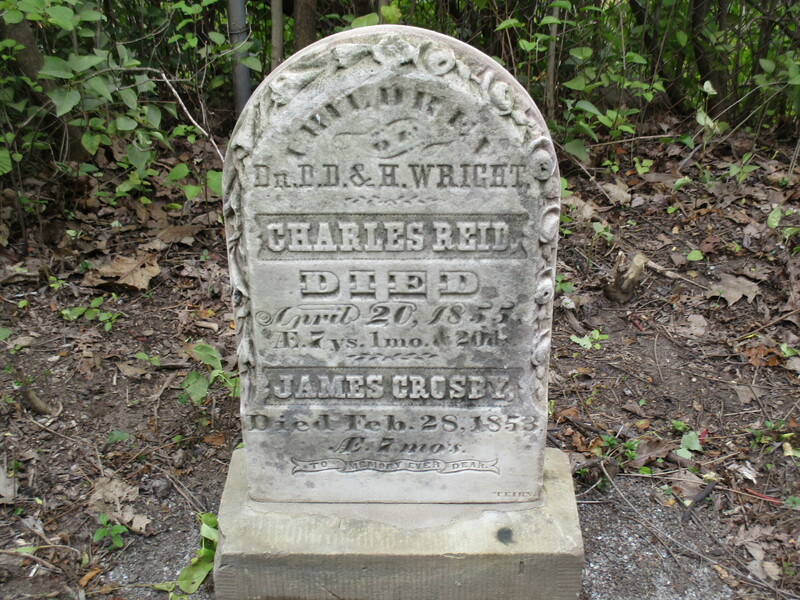 Like most pioneer cemeteries there is a tale of premature death and the loss of infants. There are several stones here that record the tragic loss of multiple children within a family. Weather has eroded some of the earliest stones until they’re almost illegible but the bold and deep carving of this one will last for many more centuries. We walked along the historical trail on the way back to the car. It follows the street and is far less challenging than the arduous journey along the edge of the creek. Looking down at the curve in the creek where we had been climbing it was obvious that this is not a hike to be undertaken alone or by those just starting out. 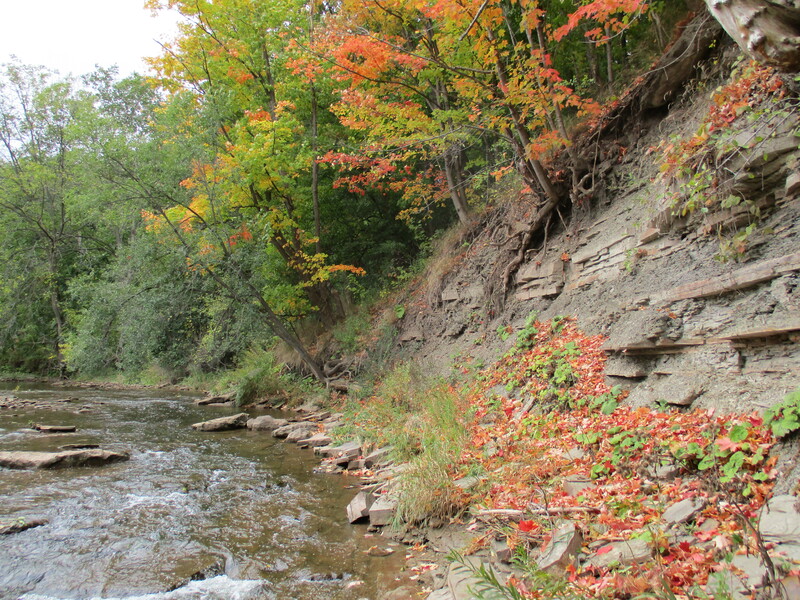 Much of the industry in Oakville was located on the west side of the creek and so a future journey may undertake to see what remains from this period. 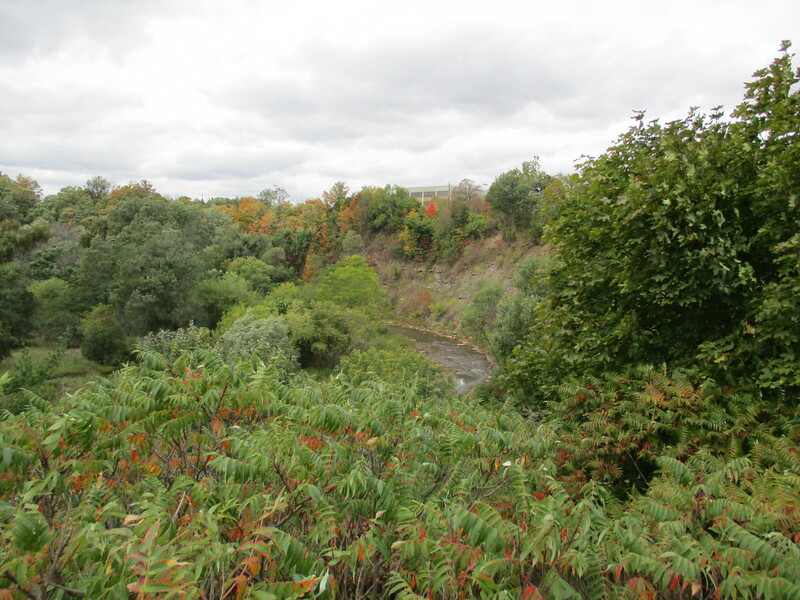 This entry was posted in Sixteen Mile Creek and tagged Cormorant, Hamilton Radial Electric Railway, Oakville Basket Factory, Scout Hall, Strawberry, Toll station, yellow iris on October 5, 2015 by hikingthegta. At the base of the at the back of St Mary’s Cemetery are the remains of the dam. On the other side if the creek is the entrance to the tunnel that went under the Hog’s Back. A cylindrical wooden flume carried water from there under the tracks and down to the original mill which below the steam engine shown in your arrival. I recently found one of the hoops that bound the flume/conduit and gave it to the museum. If you’re interested, I can show you the entrance to the tunnel. The exit is long gone.